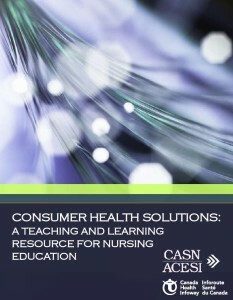 Consumer Health Solutions Resource - Canadian Association of Schools of Nursing / Association canadienne des écoles de sciences infirmières (CASN / ACESI). In 2015 CASN established a digital health nursing faculty peer network. The network was led by nursing faculty who have championed digital health in nursing education. In addition to connecting with nursing faculty all over Canada, the peer leaders collaborated with CASN to develop a resource focused on consumer health solutions, a bourgeoning area of healthcare that is becoming increasingly important in patient care. Consumer Health Solutions: A Teaching and Learning Resource for Nursing Education is a companion piece to the Nursing Informatics Entry-to-Practice Competencies and the Nursing Informatics Teaching Toolkit. This resource is designed to be used by nurse educators, to expand their knowledge of digital health and integrate consumer health solutions into their courses. By using the teaching activities outlined in the resource, educators will be able to easily integrate this growing area of informatics into their courses while still reaching the indicators identified in the entry-to-practice document. Nurses working in direct care, policy, or other areas may also find this resource useful to expand their knowledge in this evolving area of healthcare. This consumer health solutions resource came to fruition through the hard work of the members of the Faculty Peer Network. The Digital Health Peer Network was a joint CASN – Canada Health Infoway project undertaken to expand the capacity of nurse educators to teach digital health.